Pillows & Bear Giftshop proves that getting business loans doesn’t actually hurt. He partnered with colleague Milo Silva and scraped together P30,000 as capital to start Pillows & Bears Giftshop in 2005. They bought two sewing machines for P10,000 apiece from their former boss, and set up a makeshift factory in a wood-and-nipa house in Brgy. Sto. Angel in San Pablo City, Laguna, for which they paid P1,000 in monthly rent. To stretch the money, they convinced one of their old clients to give them a 50% downpayment, which covered the costs of materials. They also convinced four of their former colleagues to come on board. Still, the capital could only go so far. “Kulang sa puhunan. Nag-start kami ng May, mga December nangutang na kami sa CARD [SME Bank Inc.] ng P12,000,” says Flores of their first loan, payable in six months. Flores says business was brisk at the onset, with more clients coming in and production ramping up from June all the way to February. They sold stuffed toys to gift shop owners, companies looking for giveaways, and wedding suppliers needing customized wedding souvenirs. 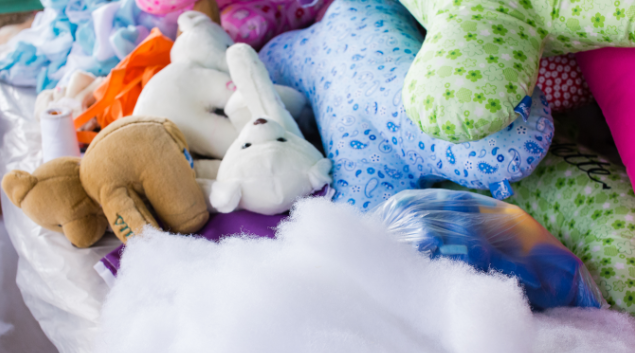 Orders grew from an initial 100 bears and pillows of various sizes, to as many as 10,000 through the peak months. 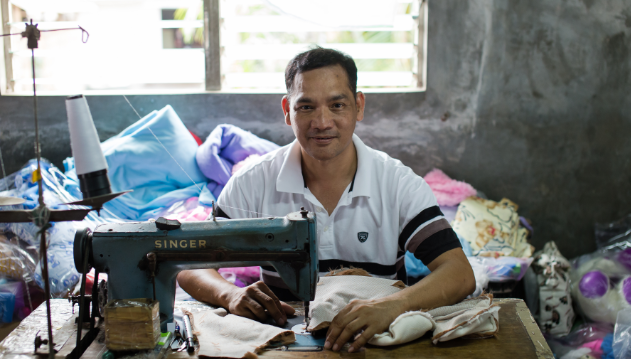 To meet stronger demand, they bought three second-hand sewing machines and hired part-time workers. To pay for overhead, Flores and Silva had to borrow money, as there was usually a lag before they got paid. As they were producing more, they had to borrow more from CARD SME Bank, until the loan size grew to P500,000. “Pag natapos yung loan mo na P12,000, doble na yung uutangin mo, P24,000, six months ulit. Pag natapos mo yung P24,000, another P12,000. Palaki nang palaki, hanggang sa umabot ng P500,000,” says Flores. It wasn’t hard to convince the bank to lend them money, says Flores, because they had the purchase orders to show that money would be coming in. It helped that they were up-to-date with their loan payments. The P500,000 loan, he says, took a year to pay at 22% interest, and they made it without trouble. By 2008, they’d opened a mall kiosk, Hugs & Touch, to ensure that they had money coming in even when large orders dried up during off-peak season. This proved a successful strategy, and they opened three more kiosks. Apart from getting collateral-free financing, they’ve also gotten training in product development via CARD MRI Development Institute Inc. “Nagbibigay sila ng oportunidad para ang negosyo mo lumago, mag-level up. Nagbibigay sila ng mga training at mga seminar,” says Flores, adding that he even got sent on a tour of the textile shops and toy factories in Bangkok—this came in handy when their local textile supplier closed shop and they had to start importing cloth, initially from Thailand, and then later from Indonesia, too. Now the challenge is in getting more workers and managing their production schedules. He admits that the workshop isn’t ideal, since they’ve opted to do most of the work manually, rather than buying expensive equipment that would speed up production. They’d bought land in the hope of building a better workshop, but scuttled the plan when they realized their workers weren’t willing to commute far from their homes. They’ve learned to make do with what they have, and it has cost them—two typhoons, in 2006 and 2009, destroyed stock when the workshop’s roof caved in. Typhoon Ondoy alone caused P100,000 worth of damage, in the same year they had to close three of their mall kiosks. But things are looking up, says Flores. They’ve got steady clients, and apart from their Hugs & Touch kiosk at the Bay City Mall in Batangas City, they’re looking at reopening one more. He doesn’t regret starting the enterprise, boasting that his four kids studied in private schools because of the business. “Dahil may experience naman kami, tatakbo kahit papaano. May market na, hindi na kami mahihirapan. Kailangan lang talagang pagtiyagaan,” says Flores.